In New Orleans, the living is always easy, but in the late summer and fall months the city becomes even more relaxed, making it the perfect place for your clients when they are looking for a last-minute summer vacation or a much-needed autumn break. New Orleans’ mild winters mean warm weather easily extends into October, creating a perfect summer vacation well after the kiddos are back in school. For those travelers who can’t get away until the summer months have ended the fun continues with We Live to Eat Restaurant Week in September and various celebrations leading into the holidays. From Sept. 14-20, diners can enjoy fixed-price menus at New Orleans’ best restaurants. Also, guests who visit in the fall are just in time to enjoy the end of New Orleans’ festival season, with Southern Decadence in September and the Louisiana Seafood Festival, New Orleans Film Festival and VooDoo Art & Music Experience in October. 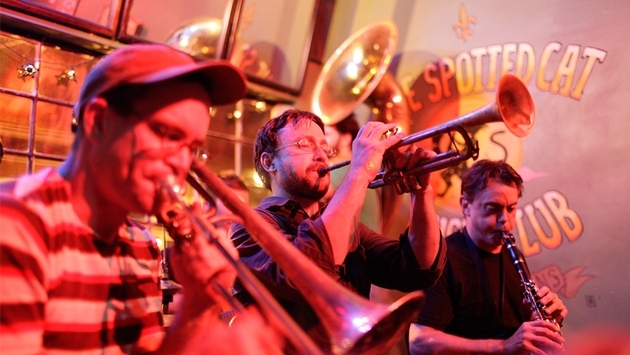 Those visiting later in the season are in for a treat as New Orleans gears up to celebrate the holidays Big Easy style. In late November and the whole month of December, the beautiful Oak trees in New Orleans’ City Park are draped in holiday lights of various colors and designs during Celebration in the Oaks, a New Orleans holiday favorite. Chanukah is celebrated in grand style in New Orleans. The largest menorah in the state is anchored in the Mississippi River and the lighting is celebrated with food, music and merriment for all ages. Seasonal concerts are held in some of the city’s synagogues and dinner parties are also held at homes throughout the city. Other popular seasonal attractions are the Reveillon Dinners held at various restaurants throughout the city. This tradition stems from the 1880s when the Creoles celebrated the start of Christmas with a big family meal when they returned home from midnight mass. The tradition was revived in the 1990s, and has since grown to include New Orleans’ top-tier restaurants that put their original spins on classic Creole menus. It is a tradition you won’t want to miss, adding to the long list of reasons why New Orleans should be your destination of choice for your next vacation. Leslie has more than 25 years of experience working in the tourism industry, specifically with travel professionals and the cruise market. A native of New Orleans, Leslie enjoys listening to live music and traveling with her daughter.